Let us look as some items of Punjabi apparel. is a long, multi-purpose scarf that is essential to many South Asian women's suits and matches the woman's garments. Some "dupatta suits" include the shalwar kameez and the kurta. The dupatta is also worn over the South Asian outfits of choli or gharara. The dupatta has long been a symbol of modesty in South Asian dress. 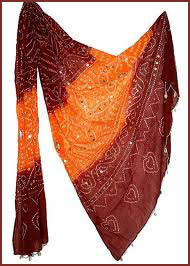 The origin of the dupatta can be traced to the Mohenjo-daro civilization of the Indus Basin located in modern-day Pakistan, where the use of textiles such as Ajrak was highly prevalent. A sculpture of the Priest King of Harrapa, whose left shoulder is covered with some kind of a chaddar, suggests that the use of the dupatta dates back to the early Indus Valley Civilization. From here it spread across the Indian subcontinent, especially during the rule of the Muslim Mughal Empire. is a type of female trousers which has its roots in Patiala City in the Northern region of Punjab state in India. The King of Patiala in earlier times had its Royal dress as Patiala Salwar. The Patiala Salwar has a close resemblance to the pathani Suit which has similar loose lowers as salwars and long knee length top known as Kameez. Over the decade the dress now is not worn by men but has classically transformed itself with new cuts and styling into women's Patiala Salwar. The reason why the patiala dress is preferred by most of the women of punjab and other regions of Northern India is its comfortability and durability in summers. Since the patiala salwar is very loose and stitched with pleats its a very comfortable outfit to wear. Its distinguishing characteristic is folds of cloth stitched together that meet at the bottom. Patiala salwars require double the length of material to get stitched. The fall of the pleats of the Patiala Salwar is such that it gives a beautiful draping effect. Patiala salwar with lots of pleats is also referred to as Patiala "Shahi" salwar since it was worn by the shahi (royal) people of Patiala city in state of Punjab. a fabric for formal occasions. It has a little shimmer and is used for sarees and dupattas.The photo (from google) shows the dupatta used to cover the head. ***** . Phulkari embroidery . ***** . Punjabi Jutti shoes . ***** . Sari, Saree . ***** . Anklets (payal) .